Closely related to the Havanese and Bichon Frise, the Bolognese originated in Italy during the 11th century. 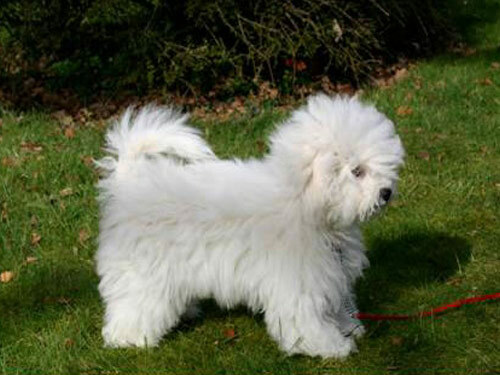 A favorite of Renaissance nobility, this breed was often presented to Belgian Royalty as gifts. With the passing of nobility the Bolognese nearly became extinct. The breed was restored and revived by Gian Franco Giannelli and is quite rare in the United States. The Bolognese are small, sturdy, and compact. They are extremely docile, exuberant, and devoted. This breed is highly intelligent and possess a pleasing disposition and vibrant expression. The Bolognese breed does best in a home with older considerate children. They do well with other animals. The Bolognese form very close bonds with thier family and suffer from separation anxiety if ignored or left alone for extended periods of time. If separation anxiety occurs this breed will become destructive and bark incessantly. They are easily intimidated and are shy and suspicious toward strangers without proper socialization. This Bolognese breed makes a good watchdog due to keen eyesight and acute hearing. Daily brushing of the Bolognese is required to prevent matting. Monthly grooming is recommended. Due to the rarity of this breed and limited human intervention, the Bolognese have no health issues. The coat of the Bolognese is long, dense, and fluffy; covering the entire body from head to tail. This is a single coat breed that sheds little to no hair. Early socialization and obedience training are a must. Bolognese are quick to learn but there may be difficulty in housebreaking. The crate training method is recommended. Training must be done with firmness, fairness, and consistency. The Bolognese will do okay in an apartment provided they are given time and attention and are not left alone for extended periods of time. This breed thrives on companionship and benefits from a daily walk or free play in a small yard.